Phytophthora tentaculata Kröber & Marwitz was described in 1993 in Germany on greenhouse-grown nursery ornamentals. It has since been found in Italy, Spain, China and the U.S. (California) causing a root and stem rot of many different plant species including nursery-grown native species used for habitat restoration. 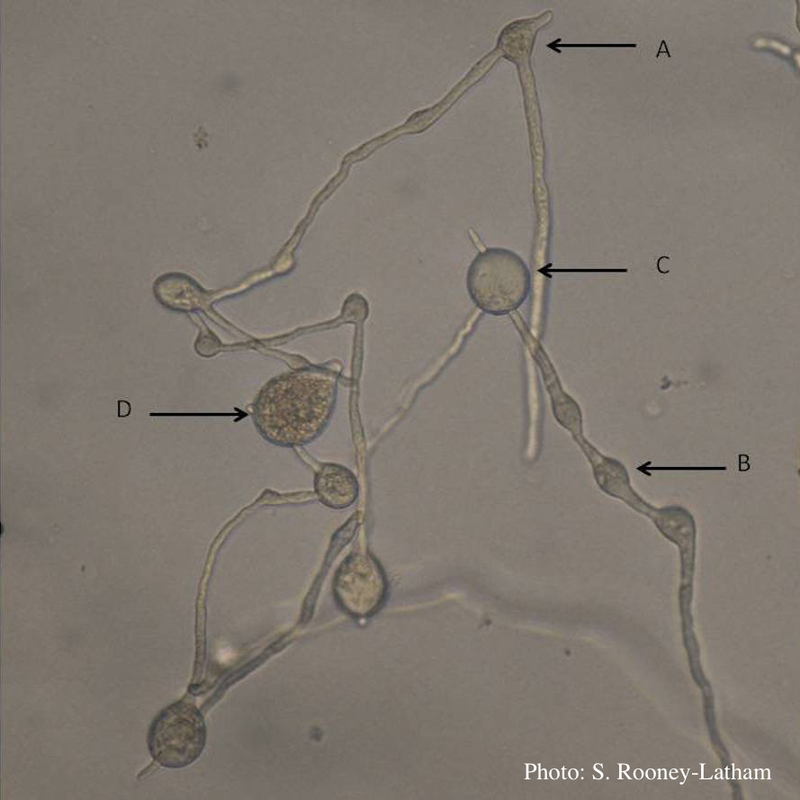 P. tentaculata is homothallic and is classified in Stamps group I which is characterized by the production of mostly paragynous antheridia, papillate sporangia and the production of both hyphal swellings and chlamydospores in culture. P. tentaculata is placed in phylogenetic Clade 1 (Cooke et al., 2000) with species such as P. cactorum, P. nicotianae, P. clandestina, P. iranica, P. hedraiandra and P. pseudotsugae. Etymology: refers to the spider web-like growth habit of the mycelium in culture. Sporangia of P. tentaculata are spherical or ovoid to obpyriform, papillate to occasionally bipapillate and measure 10-81 x 13-52 mm (average 35.7 x 27.4 mm). They are primarily noncaducous, rarely caducous with a short pedicel, and often have elongated necks or beaks. Small hyphal swellings are intercalary and often occur with hyphal branching. On PARP and V8 juice agar, the hyphal growth pattern resembles a non-organized web spun by spiders in the family Theridiidae; hyphae often grow forming loops in the agar. 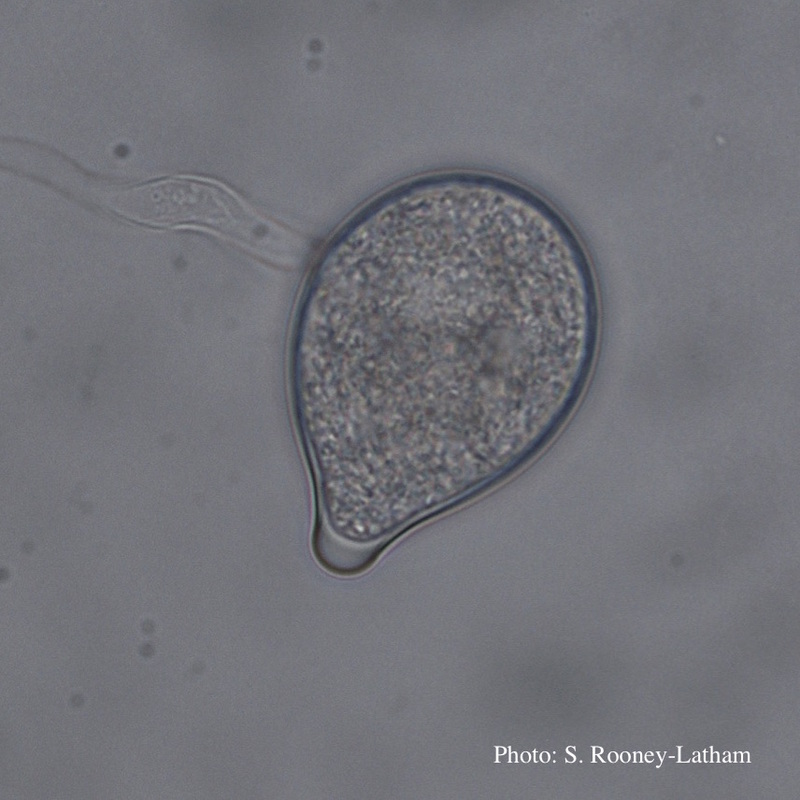 Chlamydospores are intercalary to terminal, thin-walled, measuring 10-45 mm (average 26.6 mm), occasionally with a short hyphal projection. P. tentaculata is homothallic, with mostly paragynous antheridia. 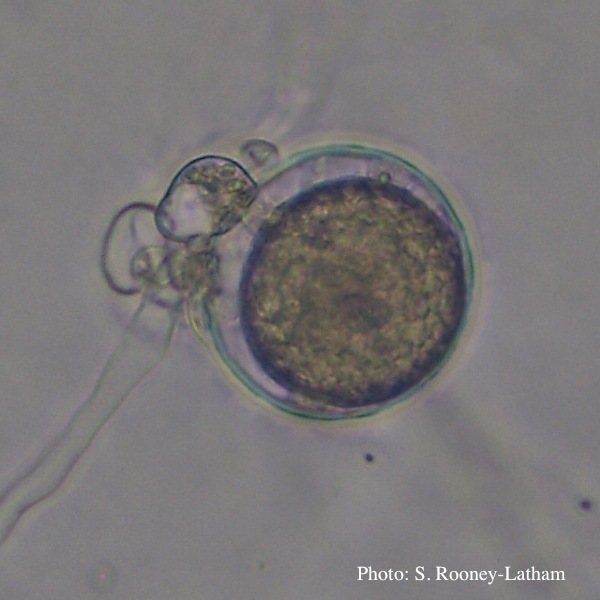 Antheridia are diclinous and often form tooth-like projections when they encircle the oogonia. Oospores are spherical, aplerotic, and measure 14-38 mm (average 28.1 mm) (Erwin and Ribeiro, 1996; Kröber and Marwitz, 1993). Left: Chlamydospore of P. tentaculata. Right: Paragynous antheridium attached to oogonium with oospore. 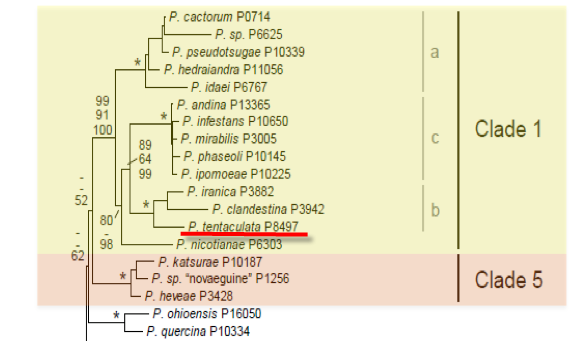 P. tentaculata is placed in phylogenetic Clade 1 (Cooke et al., 2000) along with P. cactorum, P. nicotianae, P. clandestina, P. iranica, P. hedraiandra and P. pseudotsugae, among others (Blair et al., 2008). The optimum temperature for P. tentaculata is 15-25°C, while the minimum and maximum temperatures are 7°C and 32°C. At optimum temperatures, the growth rate is 2-5 mm/d. This slow growth rate contributes to the difficulty of isolating P. tentaculata from infected plants. Colony growth pattern on V8 juice agar is fluffy with a regular margin. P. tentaculata is classified in group I based on its primarily paragynous antheridia and papillate sporangia (Stamps et al., 1990) and is a member of phylogenetic Clade 1 (Cooke et al., 2000) along with P. cactorum, P. nicotianae, P. clandestina and P. pseudotsugae, among others. It differs from P. cactorum by the production of hyphal swellings, larger oogonia and oospores, higher minimum temperature and slower growth rate. 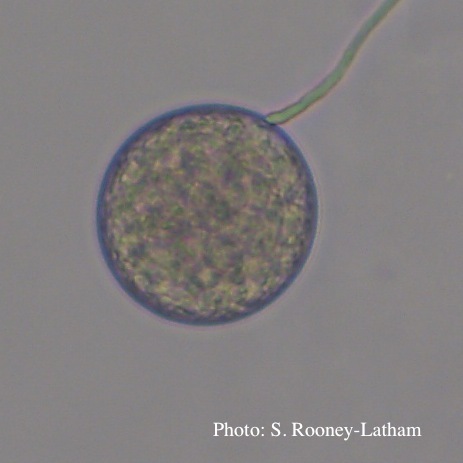 It differs from P. nicotianae by being homothallic and producing mostly paragynous antheridia. It is distinct from P. clandestina and P. pseudotsugae by the production of chlamydospores and has a faster growth rate than P. clandestina. 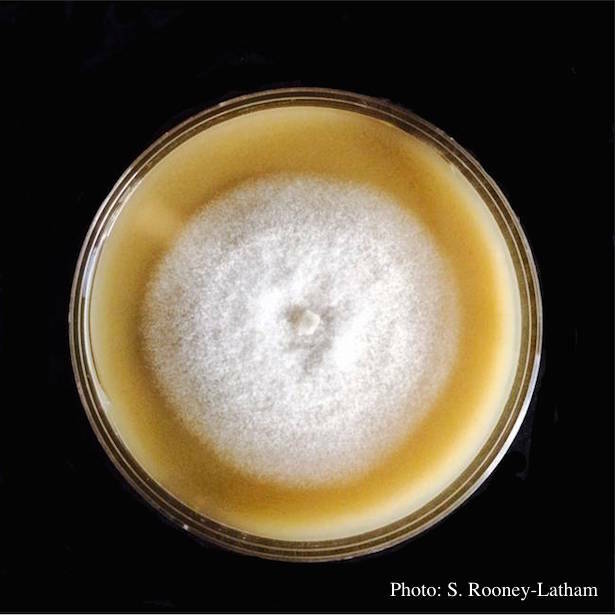 For more information about Phytophthora tentaculata, visit our Disease, Education and Management materials, and Reference sections.